Αυτό είναι το καταπληκτικό Boston Whaler 380 Outrage μια ολοκληρωμένη μηχανή ψαρέματος για την ανοικτή θάλασσα με πολύ λειτουργική διαμόρφωση καταστρώματος, πολλές ανέσεις και πλούσιο επίπεδο εξοπλισμού, μεγάλη λίστα αξεσουάρ και πολλές επιλογές ώστε να μπορεί ο ιδιοκτήτης να δώσει την διαρρύθμιση που ανταποκρίνεται καλύτερα στις ανάγκες του. Η πολυμορφικότητα είναι ένα βασικό στοιχείο εφόσον το σκάφος μπορεί να χρησιμοποιηθεί ως ένα πολυτελές cruiser που προσφέρει την δυνατότητα διανυκτέρευσης, ένα τέντερ για τα μεγάλα γιωτ και ένα σκάφος για την διασκέδαση μας γενικά. Περισσότερες πληροφορίες στο δελτίο τύπου που ακολουθεί (Αγγλικά). 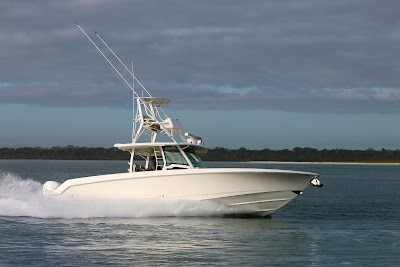 This is the amazing Boston Whaler 380 Outrage a complete offshore fishing machine with very functional layout, many amenities and rich level of equipment, long list of accessories and various options so that her owner can give the configuration that best fit his needs. The versatility is a prominent element since the boat can be used as a luxury cruiser offering the possibility for the overnight, tender for the megayachts and an entertainment vessel. More description in the press release that follows. 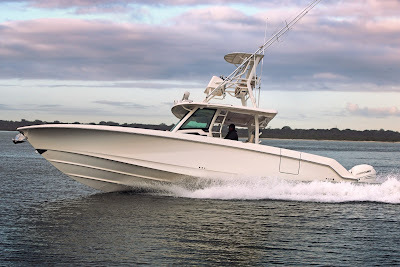 Edgewater, Fla. (Feb. 16, 2017) — It’s a boat that confidently navigates the spectrum of on- water activities, empowering epic offshore fishing runs as beautifully as it hosts memorable social gatherings: the all-new Boston Whaler 380 Outrage. Making its world premiere this month at the Miami International Boat Show, the 380 does more than rise to an occasion — it soars. 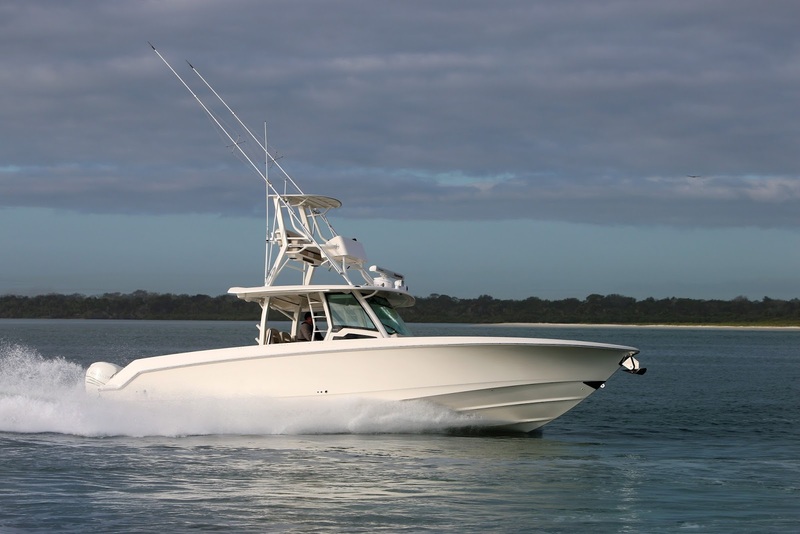 A host of state-of-the-art technologies help the 380 Outrage stand out from the pack. Remote connectivity is available through Whaler Watch, an optional package that monitors boat systems and vessel position via satellite to ensure 24/7 security. Added stability at sea comes courtesy of the available Seakeeper® gyro-stabilizing system, reducing boat roll by a significant margin. At the helm, dual widescreen helm displays feature the latest Raymarine® navigational technology and offer full control of the Bluetooth-compatible stereo, as well as the Mercury® propulsion. 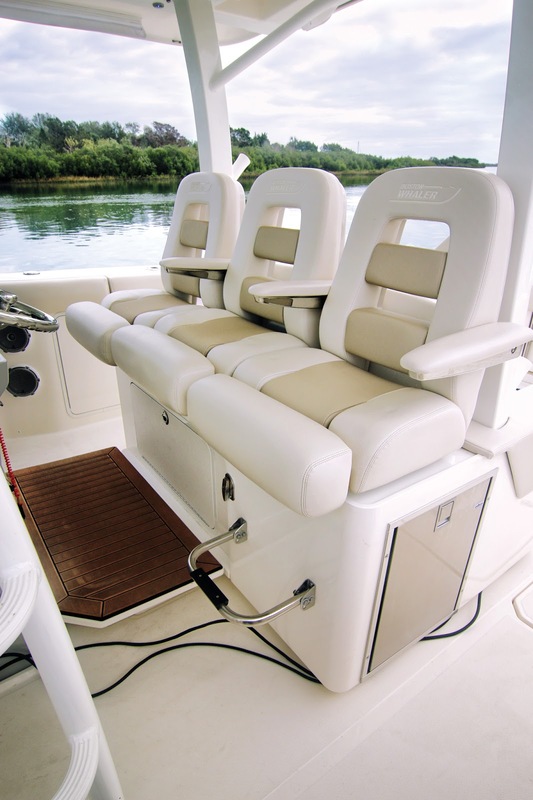 To that end, the 380 Outrage features triple Mercury Verado® engines, with optional Joystick Piloting for effortless docking and seamless command. Whaler’s precision-engineered hull is designed to work seamlessly with the engines to provide unsurpassed efficiency and reliability; smooth, predictable handling; and a soft, safe, dry ride. Truly, it’s a boat that begs to be driven. 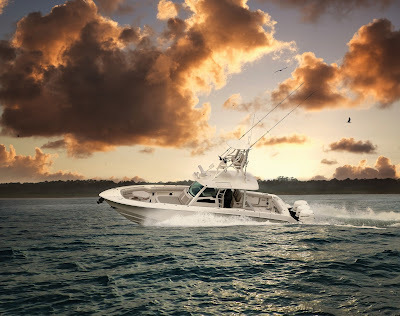 Amenities for serious fishing include a 60-gallon transom livewell, large in-floor fishboxes, a well-equipped leaning post, and ample rod holders placed strategically throughout the boat. 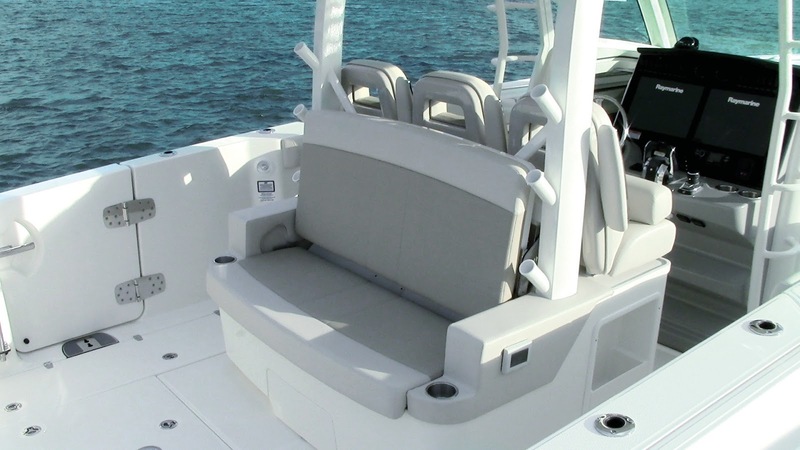 An integrated hardtop offers protection from the elements, while the air-conditioned helm deck boasts seating for the captain and two companions — including bolsters and fold- down arm rests — for ergonomic comfort at rest or underway. 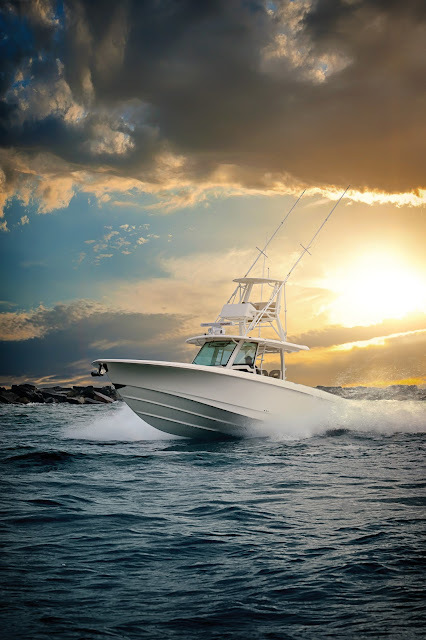 The 380 Outrage also accommodates an optional upper station with an array of available electronics, providing anglers and pleasure boaters alike a superior view and confident command. For entertaining, the optional Summer Kitchen replaces the leaning post and adds an electric grill. Factor in the new aft-facing couch, optional removable table, and an optional sunshade that deploys and retracts electrically from the hardtop, and there’s no question the cockpit is a perfect gathering place for family and friends. 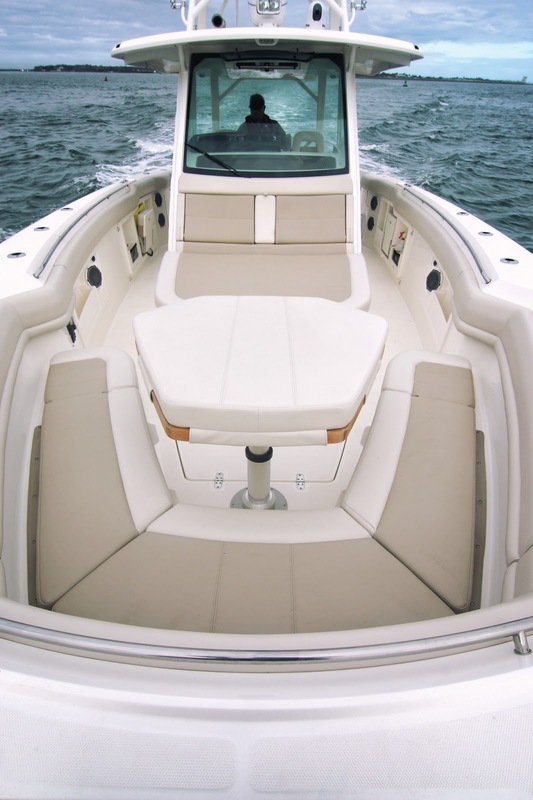 Whaler’s design ingenuity is also apparent in the 380 Outrage’s bow, where the coaming has been pushed out in a notched configuration to expand seating and storage. An available bow sunshade lends added sun protection, and an optional bow table with filler cushion can be raised and lowered electrically to suit the day’s activities. There’s also plenty of space for everyone’s gear. 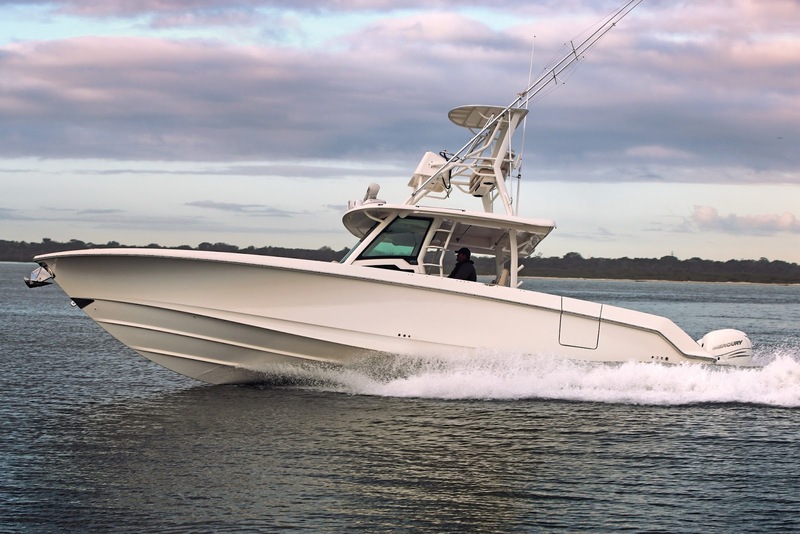 The 380 Outrage features Whaler’s signature bow “garage,” a cavernous compartment located beneath the bow lounge seat that accommodates dive tanks, life jackets and more. Additional storage throughout the boat provides out-of-the-way but at-your-fingertips access to everything you bring onboard. Below deck, the spacious air-conditioned cabin features a fully enclosed, lockable head for added comfort and privacy. A dining area in the V-berth converts to form a double bed, making it a great spot to duck out of the sun or enjoy an overnight or weekend-long stay. Other amenities include a vanity with vessel sink and mirror, a microwave, and LED-diffused blue courtesy lights.